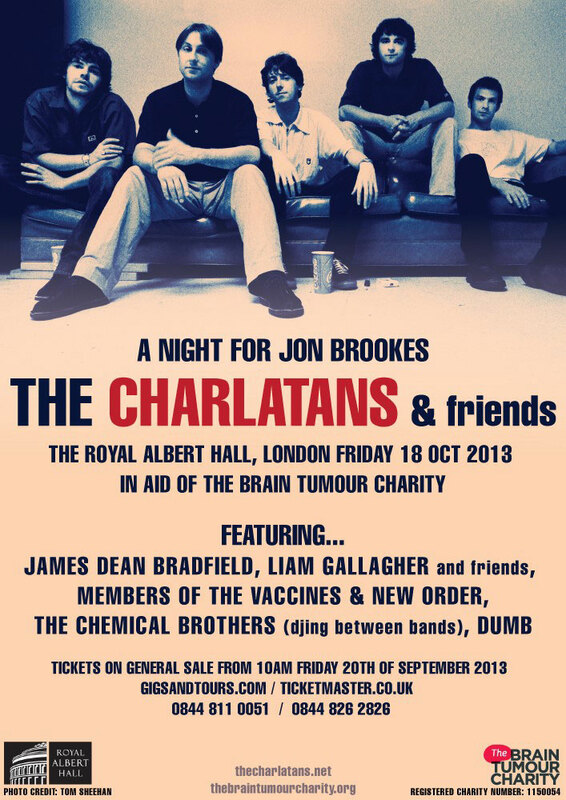 The full line-up for A Night For Jon Brookes - The Charlatans and Friends has been confirmed. The gig in honour of the late drummer takes place at the Royal Albert Hall on October 18. Manic Street Preachers frontman James Dean Bradfield and members of The Vaccines help complete the bill, which already includes Stephen and Gillian from New Order, Liam Gallagher and the remaining members of The Charlatans. The Chemical Brothers will be DJing in between bands. Upcoming pop-rock four piece from Birmingham Dumb complete the line-up. "Following the loss of our much missed friend and drummer, Jon Brookes, we, together with some friends, are putting on a show at the Royal Albert Hall on Friday 18th October 2013. The show will benefit THE BRAIN TUMOUR CHARITY, which Jon was involved with during his illness. It's our way of raising money for research into and awareness of a cancer that will unfortunately affect many lives as it has ours. We look forward to seeing you at the RAH and making it a night to remember," The Charlatans commented. Jon Brookes was diagnosed with a brain tumour in 2010 and returned to drum with the band less than a year later. However, he passed away on August 13 this year. More than 9,000 people are diagnosed with a brain tumour each year and brain tumours are the biggest cancer killer of children and adults under 40, yet less than 2% of cancer research funding goes on brain tumours in the UK.